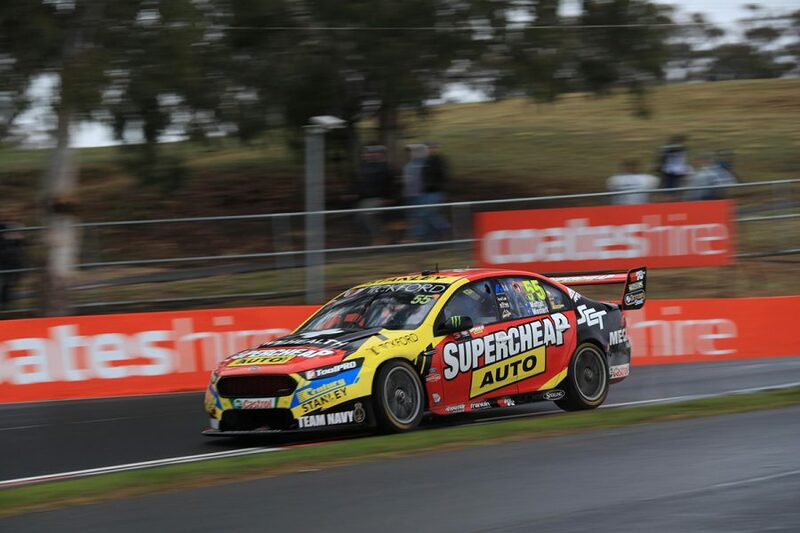 Will Davison set the pace in a wet opening practice session for the 2018 Supercheap Auto Bathurst 1000. 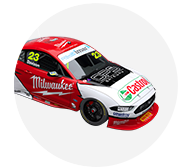 The Milwaukee Racing Falcon jumped to the top of the order at the very end of the 60-minute session at Mount Panorama, Davison displacing Chaz Mostert. Nissans filled third and fourth, with the entries of title rivals Shane van Gisbergen and Scott McLaughlin seventh and 16th. Following rain earlier in the morning, lap times fell through the opening stanza from an initial 2:38.9903s by Mostert to van Gisbergen's 2:31.1971s benchmark 15 minutes in. Van Gisbergen turned a 2:29.3623s and 2:28.8205s 10 minutes later to be 1.4 seconds clear at the halfway mark. Richie Stanaway moved into top spot with a 2:27.3396s, just before the session was red-flagged with 23 minutes remaining for wildlife on the circuit. 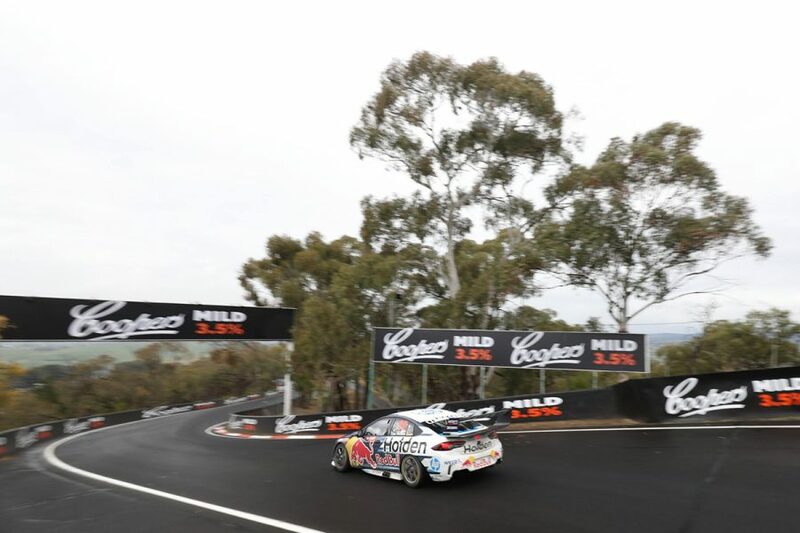 As a dry line continued to emerge, van Gisbergen reclaimed the top spot with 13 minutes to go, turning a 2:26.3577s. Mostert shaded that with a 2:26.3322s, then turned a 2:25.5388s with five minutes left, as van Gisbergen handed over to co-driver Earl Bamber. 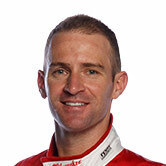 It looked set to be enough to finish on top, before Davison logged his 2:25.0243s after the chequered flag had flown. That put Davison, sharing his Falcon with brother Alex, 0.5145 seconds ahead of the Mostert/James Moffat Ford. Mostert said: “It was pretty tough. “I expected it to rain a bit more towards the end. There was a bit of a dry line, so I reckon the last lap or two could have been slicks. Late laps from Aaren Russell and Michael Caruso put their Nissans third and fourth, the pair bumping Mark Winterbottom down to fifth. The lead Shell Ford of Fabian Coulthard/Tony D'Alberto was sixth, with McLaughlin/Alex Premat's Falcon 16th. What was van Gisbergen's benchmark fell to seventh in the order, with the sister Red Bull Holden of Jamie Whincup/Paul Dumbrell 10th. Between them were the Nissan of Simona De Silvestro and Holden of Scott Pye in eighth and ninth, while Stanaway wound up 11th. The campaign of Craig Lowndes and Steven Richards got off to a slow start, their Commodore requiring a steering-rack change after Lowndes' first run. That did not fully rectify the problem and the pair were ultimately limited to nine laps and 20th place. Last year's winning outfit, Erebus Motorsport sat out the session, neither of its Penrite Holdens leaving the garage due to the wet conditions. Tim Blanchard was the only driver to try slick tyres during the session, heading out in his CoolDrive Commodore on the rubber inside the final 10 minutes. He could not get near his time on wets during a single run before switching back, finishing 17th in the order. Practice 2, an hour for co-drivers, starts at 12:55pm.